Apraxia Monday: New Series Coming Soon! And since we’re on the topic of learning and it’s September…well, it’s the perfect time to introduce a new series here on Speaking of Apraxia. Also, The Time Timer (http://www.timetimer.com/) and a new book from Woodbine House (the publisher of Speaking of Apraxia). In the meantime, you may appreciate this Q&A article I wrote for Ages & Stages, a website hosted by Diane Bahr, CCC-SLP http://www.agesandstages.net/featurefaq.php. In fact, if you’d like to read more, you can do so by clicking the “In the Media” tab at the top of this page to see ALL of the articles I’ve penned on the subject. If you have a product suggestion you’d like to see reviewed–or would just like more information on, please shoot me an email at leslie_lindsay (at) hotmail.com and I’ll see what I can do! Now is a great time to start thinking about what a successful school year looks and feels like to both you and your student. Go ahead, close your eyes. Dream up a perfect day–week–or year. What does it consist of? Well-organized, energetic kids? Yep. Eager-to-learn kids? Sure. An active parent volunteer? You bet. A well-executed IEP/504? Ugh. Exactly. It may have been months since you’ve laid eyes on the document, so go ahead and pull it out. Review it. Do you understand it? Does your child? If you’re uncertain on a few points, don’t hesitate to ask. That’s what school officials are for. Make a list of your child’s strengths and talents and hand them out to her various teachers, aids, and others who need to know. The school psychologist. This person typically has at least a master’s degree and certification to work with kids on an on-going basis at the school level for things related to career and academic development, socialization, educational testing, and more. They are a very valuable resource to the education team. The school social worker. 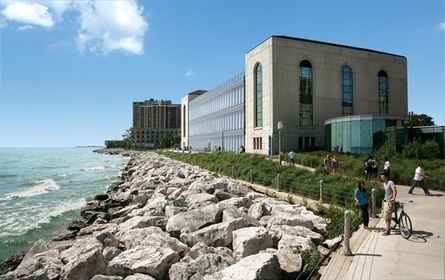 A MSW (master’s of social work) degree is generally the qualifications for these individuals. They may come into your child’s classroom to speak in whole-group form about bullies, relational aggression, anger management, organizational skills, etc. If your school doesn’t have a program where the SW comes into classrooms (not all do), they may still have one on site for individual pop-in sessions for things like socialization, conflict management/mediation, and other such concerns. Some even do a bereavement or divorce care group for kids. Reading Specialist. My daughter may be resolving from her apraxia, but we know the reading specialist–she has been part of Kate’s “menu” for the last three years. It’s well-established by the research literature that kiddos with CAS has more difficulty with learning to read, comprehension, and application of reading materials than non-CAS kids. If you have a reading specialist at your school (most do), get her on-board with an assessment first and an individualized plan. Resource Teachers. To qualify for a resource aid, you may need an IEP/504 on board. Definitely something to look into for your kiddos…Once a stigma to go to the resource room, you can reframe the experience as, “A teacher who will help you be the very best you can be.” It may mean this teacher reviews classroom material with your child, presents it in a slightly different manner, or provides additional time/respite from a loud/distractable classroom. She also wrote in her planner, “Be better at math and participate more in the classroom.” All unprompted by mom and dad. This concludes our special back-to-school series.! Hope you enjoyed it and eased some of your fears/concerns. Up next: a series on great products, books, etc. to help your family. Making a good first impression certainly comes from within. When you are happy and confident, you project a happy and confident you. It’s really that simple–and that complicated. A good starting place for our kiddos with CAS is to make a list of all things they are good at..grab yourself a big piece of posterboard and solict their help. You can draw pictures, snip images from catalogs and magazines, use real photographs you print out, or simply write those things down. This is ______. He is really good at….Hang the poster in his room or on the fridge. Kids going to kindergarten can be exciting, overwhelming, and nerve-wrecking. But never fear–with the right amount of prepaparation and support, kiddos (with, and without) apraxia can thrive. Also, you may consider making a social story for your kiddo. Social stories feauture your child as the main character. There was once a little girl named ____ (your daughter’s name). She had a wonderful summer doing ___, and ____. But as August drew near, we started preparing for kindergarten. We bought some school supplies, a new outfit and new shoes. She looked so pretty. 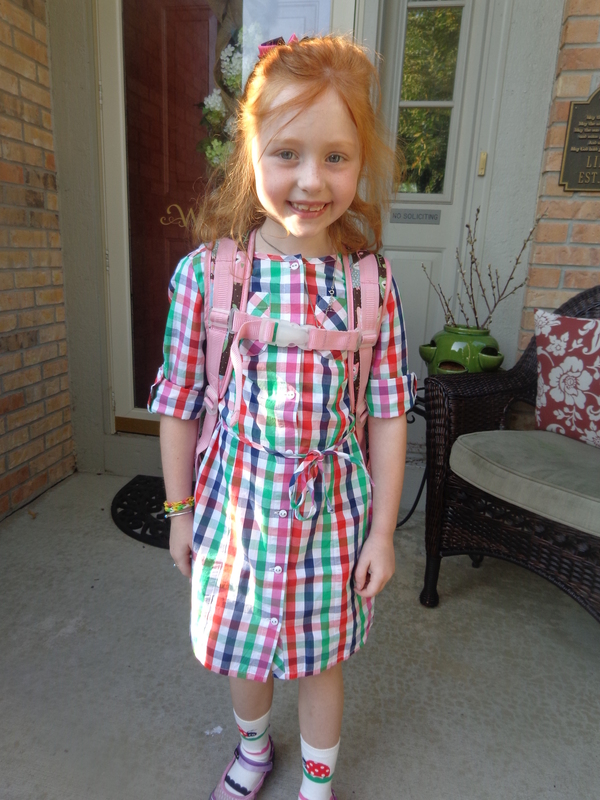 Here is a picture of ____ on her first day of school. (You can add real photos or have your son draw them). She was excited and a little nervous, but he was going to be just fine. Here’s a picture of ____’s teacher. What a nice teacher! The concept behind social stories is you use your child’s name, photo/drawing to tap into common feelings and emotions. Make it positive as show him overcoming some fears. And yours, too! Being the bookish kind of girl I am, try looking for some first day of school books at your local library or bookstore. The Night Before Kindergarten is one of my favorites (there are other versions as well…night before preschool, and 1st grade for example). Other books to consider–I Want to be Your Friend by Angela Baublitz is all about her daughter was apraxia, and how she loves doing things that everyone else does, too. Look for it at Amazon.com and the CASANA website. Rhyming can be notoriously hard for children with apraxia. Read rhyming books like Dr. Seuss and Sandra Boynton often. Joke around with rhymes throughout your daily routine. Practice with phonics and books that use explosive language, yikes! bam! Kapow! Have your child repeat if he can. As for speech…remember that kindergarten kiddos aren’t expected to be 100% proficient in language–it’s still a developing skill. You may want to conference with his teacher just so she knows what is going on with your son–that she’s a bright girl with great receptive language, just that his expressive is lagging. Best wishes for a happy and successful school year! While I understand many of these anxieties are normal, and some may be more specialized for your child’s developmental level, keep in mind this is a general guide. I’ll do my best to answer in terms of experience and offer some suggestions for you as well–all with the help of my daughter, Kate. Ready?! Let’s do it! Kate & I suggest: “School isn’t any more hard for kids with CAS,” says Kate. Her mom begs to differ! While I am proud of Kate’s insight, I have to back her answer up with a little reality. School will be harder for kids with CAS. If there was a quick and easy answer, I’d give it to you. Truth is, kids with a history of CAS have more difficulty learning to read, rhyme, sound out phonics, and may struggle with the abstract world of numbers (although some kids excel at math–it’s much easier than written and spoken language to them!). Work with your child in the last few days leading up to school in sitting still, holding a pencil, doing worksheets/workbooks, etc. Time it…”For twenty minutes, we are going to play school; you can read or work in your workbook, do flashcards.” It will give him the practice he needs to begin taking school seriously again. COMING UP NEXT WEEK: Making a good first impression, social stories, etc. Till then…SPREAD THE WORD! 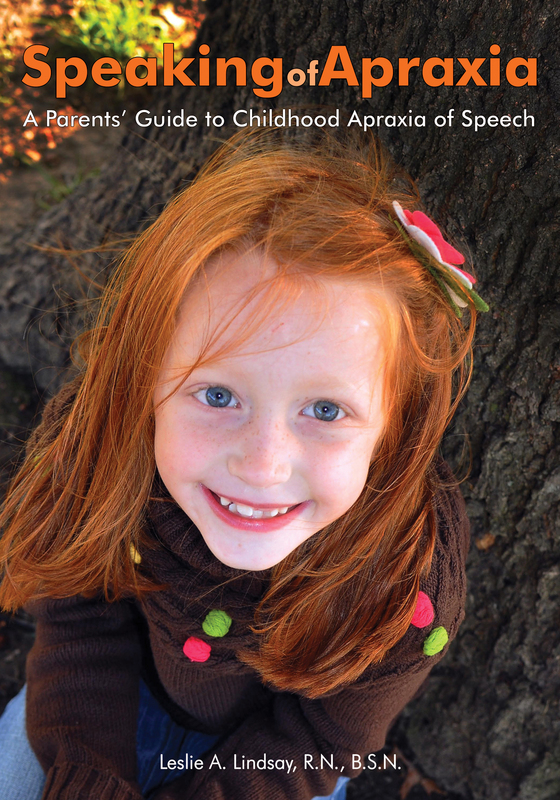 For more information on school, see chapters 10-12 of SPEAKING OF APRAXIA, an award finalist publication from Woodbine House, 2012. While I could share volumes of wisdom and guidelines for these questions, I won’t bore you–instead I’ll give you just a bit to whet your appetite. PRESCHOOL READINESS: If your child has been in early intervention services, then chances are once your kiddo is three years old, she’ll be transitioning from those state-based services to the public school system. Be sure to talk with your therapists (SLP, OT, PT) on how that is typically handled in your district. To qualifty for public preschool services, your kiddo will need to be evaluated just shy of her third birthday (give yourself about three months lead time). A lot of preschool programs will enroll your child at her third birthday, regardless of what time of year she was born. For example, my daughter Kate hopped on the bus one day after she turned three. (that’s a whole other post). Look into your state’s requirement for kindergarten, they all vary. Assuming your child has met the state requirements for kindgergareten, consider obtaining your SLP’s professional opinion. “Is my child really ready for kindergarten?” SLPs are very in-tune with kids, child development, and what is expected of them at the school level. Have an open and frank conversation. 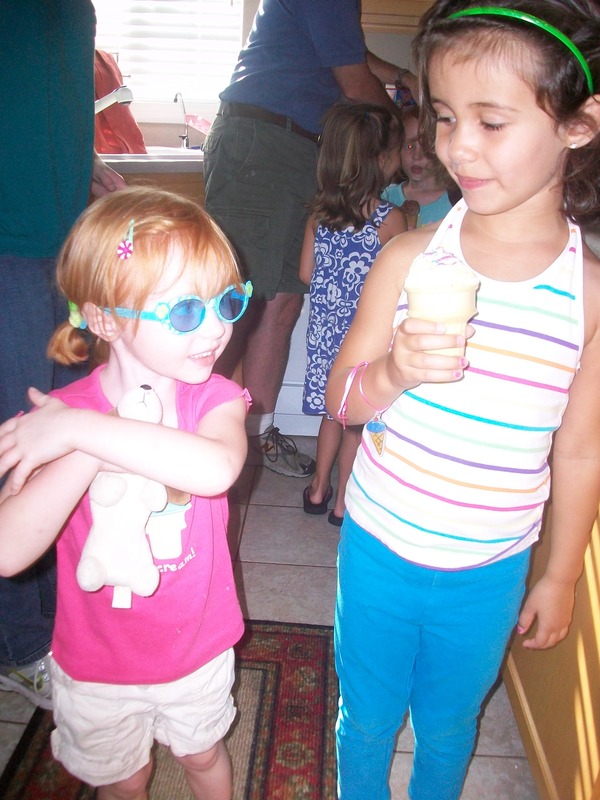 We took our daughter to speech all through the summer leading up to her kindergarten year even though she technically tested out–we really wanted her to have the skills under her belt and not lag behind her classmates. You may consider adding in an OT session or two before kindergarten begins–handwriting, scissor cutting, sequencing, and other fine motor skills like that may pop up in kindergarten. Best to get an opinion beforehand. EASING YOUR FEARS & WORRIES…. No doubt you have a lot on your mind. But as mentioned earlier, if you’re anxious, your child will be too. Practice saying self-confidence boosters to and with your child. Make it speech practice, if you want! Till next week…when we talk about getting ready for the first day! Coming up: Taking Apraxia to School! We have a new series coming to Speaking of Apraxia–one to get you and your little one all ready for back-to-school! Whether you are sending your little one off for the first time, deliberating if your child is ready for kindergarten, or adjusting to a new school year, this next 4-6 weeks of “Apraxia Monday” are for you! Is My Child Ready for Kindgergarten? As always, if you have any questions, concerns, or specific topics you’d like to see addressed, let me know! I’ll do my best to accomodate your needs. Just drop me a line at leslie_lindsay(at)hotmail.com. Here’ to a great school year!